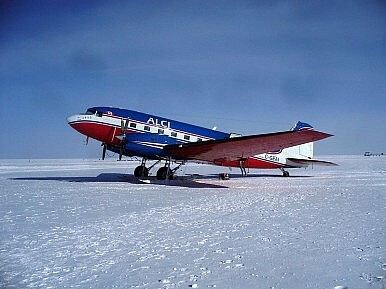 A Basler BT-67, similar to the one used for China's first fixed-wing Antarctic flight. The new squadron is part of a larger attempt to expand China’s presence in the Antarctic. China is going to set up its first air squadron in Antarctica in 2016, China Daily reports, citing the State Oceanic Administration. The squadron will support China’s ongoing scientific explorations in the Antarctic. As China Daily noted, China currently has 277 researchers in Antarctica, working out of four research stations. The SOA didn’t provide details about the squadron, other than to say its goal will be supporting China’s scientific operations in Antarctica. The aircraft will be used in part for air observations and other research missions. China just conducted its first-ever air mission with a fixed wing aircraft (rather than a helicopter) last year. That mission, however, was carried out by a Basler BT-67 built in the United States and actually operated by a Canadian company. Sun Bo, the deputy head of the Polar Research Institute of China, told China Daily that China is in the process of training pilots and ground support staff for China’s own Antarctic air squadron. Air support – both to resupply Antarctic research expeditions and to conduct scientific research – is a crucial part of Antarctic operations. U.S. research missions in Antarctica, for example, have had air support provided by the 109th Airlift Wing of the New York Air National guard for over 27 years. Last year, the 109th AW deployed 575 airmen and seven LC-130 “Skibird” transport planes (a ski-equipped variant of the C-130 Hercules) to McMurdo Station in Antarctica. In addition to providing supplies, the LC-130s also conducted missions with IcePod, “an integrated ice imaging system that can measure in detail both the ice surface and the ice bed,” according to Lt. Col. Blair Herdrick, chief of Antarctic Operations for the 109th AW. China’s new Antarctic air squadron is just the latest sign of the country’s growing presence in Antarctica. Last year, China announced that it was preparing to build a fifth research station on the continent; researchers are currently mapping the prospective site at Victoria Land on the Ross Sea. China is also building a second icebreaker ship, to join the Xuelong, currently China’s sole icebreaker. The new ship, which is supposed to be commissioned this year, will be China’s first domestically-built icebreaker; Xuelong was built in Ukraine. China is a signatory of the Antarctic Treaty system, which bans military activity and resource exploitation on the continent. But there are concerns that China, like other countries, is jockeying for position in the Antarctic with an eye toward 2048, when the treaty banning mining operations on Antarctica comes up for review. Antarctica is believed to have a wealth of oil and mineral deposits, and according to Anne-Marie Brady, an expert on China’s polar activities with the University of Canterbury, Beijing has made it “loud and clear to domestic audiences” that these natural resources are its main interest in the region. In the near term, however, China’s operations – including those of its new air squadron — will remain purely scientific. China’s Polar Strategy: An Emerging Gray Zone? How China is positioning itself to wield influence in the Arctic and Antarctic. What Does China’s Fifth Research Station Mean for Antarctic Governance?Demystifying China in AntarcticaChina and Russia Are More Likely to Become Allies Than You ThinkCelebrating Mao and Visiting Yasukuni ShrineWhat Are China’s Plans for its Airborne Corps?